Ideal for manufacturing high-volume products such as cordless telephones, pagers and two-way radios, the Agilent 8647A Synthesized RF Signal Generator delivers essential performance and reliability at an affordable price. 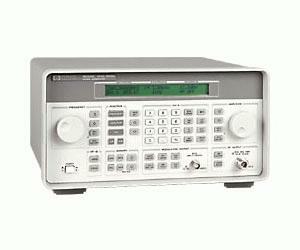 Designed for semi-automated receiver test, and a variety of general purpose applications, the Agilent 8647A meets stringent quality standards and promotes measurement consistency and repeatability. For example, the all-electronic attenuator, with no moving parts, easily handles millions of amplitude cycles with highly repeatable results. In addition, the simplistic design of the front panel shortens the operator'''s learning curve and increases productivity. With 300 storage registers and ten user-definable sequences (accessible from a remote keypad), the Agilent 8647A easily adapts to any test procedure.